Saving Animals & Healing Hearts is dedicated to the rescue, rehabilitation, and rehoming of animals. Prospective owners will have to complete required paperwork before being approved for adoption. Contact us to learn which documents apply to the animal that interests you. Bennie and Joon were rescued out of the Ontario livestock option. They were emaciated, terrified, and their eyes were swollen shut with pus and blood running out of them. It took months of treatments cleaning out their eyes twice a day and treating them. The prognosis was not good per the vet. However; The outcome was better than expected. June was able to re-chain almost all of her site, with only a small ulcer ration in her right eye. Unfortunately Benny lost his site in his left die and has some loss in the right eye as well. Even though it was better than expected it’s still change their lives forever. 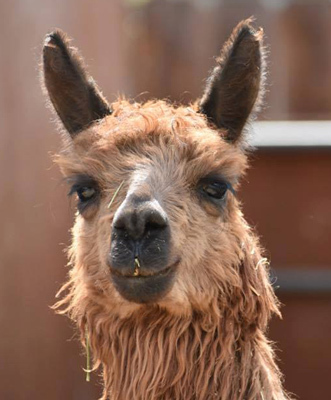 Mini alpacas are used as guardians in open fields. Because of Benny’s blindness he can never be that kind of an alpaca. His dependence on June for site is evident. Because of their limitations Benny and Joon are only adoptable under very special circumstances to a very special home. They require fly masks put on and take it off every day during fly season. They are hesitant to trust and prefer her not to be handled. There is a special person out there for them and until we find them they will stay here safe and sound. Blondie is approximately 16 years old and came to us wild and unhandled. As a matter of fact she came in with Brownie! Imagine my surprise when I emerged from the hospital after emergency back surgery to find two wild mustangs in my round pen. It has been quite an adventure. Blondie had a sponsor for awhile and we were able to put some training on her in the hopes of adopting her out to a special home. 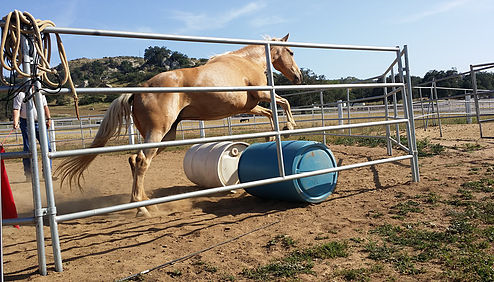 What we found was Blondie is SMART and one of the most sensitive reactive horses I have ever met. She is a challenge at times, but really seeks to please. Unfortunately, her sponsorship ended before we could further training and we have not had the funds available to continue training other than what I can personally do on the ground. Attempts at adoption only brought about flippers who wanted to throw some time on her and flip her. That was not going to happen. Not on my watch. Blondie and Brownie are incredibly bonded. They have been together their whole lives so adoption as a pasture pet with Brownie is her best dream forever. I hope some day we can find that dream. Someone who wants two sweet gorgeous horses to frolic in the pasture and enjoy their beauty. Until then, Blondie is seeking a sponsor to help with expenses each month. 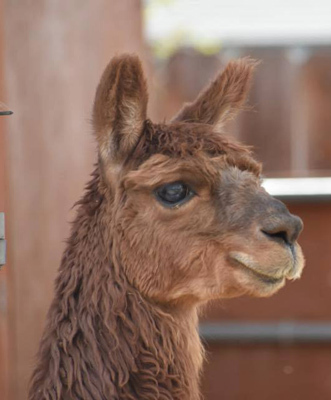 Brownie is approximately 16 years old and came to us wild and unhandled. Although not branded, the vet believes she is a mustang. She came in with Blondie and is said to have been together with her their whole lives. After taming Brownie, she began a regular work/training schedule only to consistently go off in her left rear and hip. 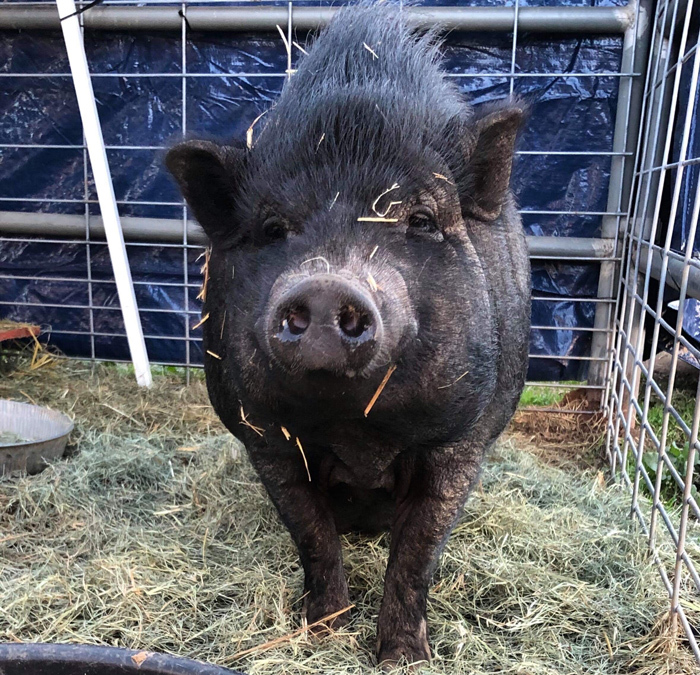 Over time it became apparent that given her age and background she would be best served to be a pasture pet and will be adopted as such and must go with Blondie as they are very bonded. Brownie is seeking a sponsor to help with expenses each month. 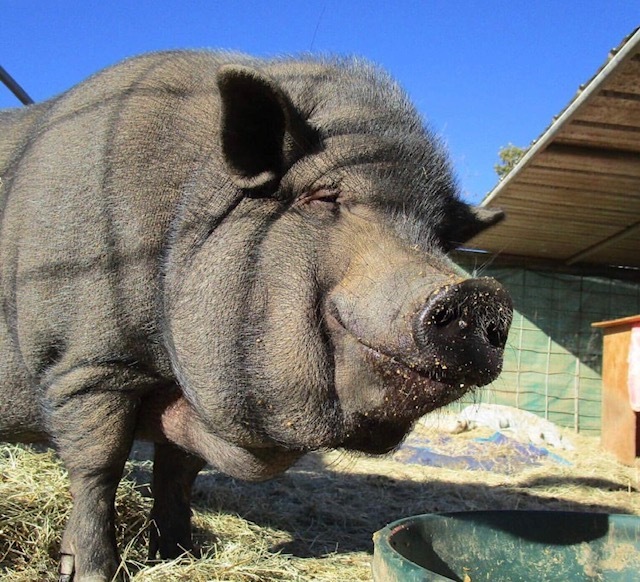 Bernadette (brave as a bear) is one of 23 pigs that we rescued from South Bay. She is spunky, independent, and her beauty catches everyone’s attention. She is currently in our Spay and Neuter Fundraiser. Once she has been spayed she will be looking for her very own forever home. If you have the ability and desire to have her spayed yourself she is available for adoption now with a spay contract. Criss is one of the most handsome boys we have! His previous owners didn’t give him the love this teddy bear so truly deserves. We are working with him daily to help bring back this babes confidence. We can’t wait for the world to see what we get to every single day! Keep a close eye on this boy- he will melt some hearts one day soon!